A person, a yogi lies on the mat with protruding nails, his assistant, the young woman throws a big nail that bounces off the man's body. 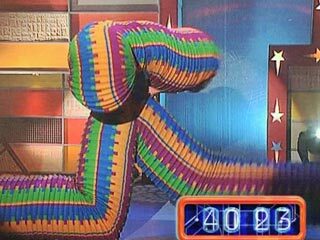 Color tansformer in the form of a worm performs different shapes. A person, the young man in a colored shirt, making somersault, pours, mixes, sets fire, juggles bottles at the same time. A person, the young man in a Russian folk costume, plays the samovar as the trumpet, and in his boot like a harmonica. A person, the young man with a bandage on his head as a helmet and blue tights, juggls with fire and performs with a python. A person, the young man in a Russian folk costume, played on spoons provocatively. Two persons, the young man and girl dance with burning torches, the young man stands on burning coals, swallows fire, makes a rack on the hot coals. Bruce Khlebnikov invites some men from the audience to compete for tearing the huge catalogues and wins in this entertaining show. Bruce Khlebnikov suits competition for inflating warmers and wins. Bruce Khlebnikov breaks thick calendars. Having the bridge Bruce holds the two women, then he inflates a rubber warmer. A young woman dressed as butterfly is dancing on stilts and lifts his leg. Extreme show: a person pierces his neck with two spokes, hammers nails into his nose and plays with fire. 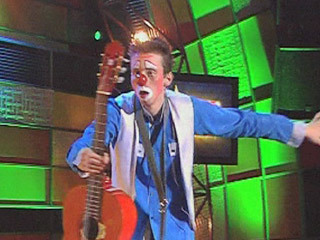 Clown in a blue shirt and a light vest with a guitar shows pantomime of love and affection. Circus the young woman and the goat. 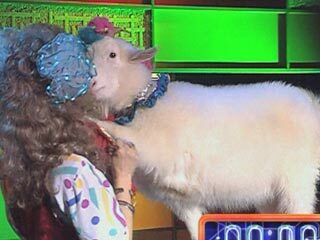 A trained goat dances with the woman, jumps over hir legs, plays a tambourine. A person, the young man in pink tights, ignites the torches and swallows them, holds burning torches through the body.